Close to nature in their Bush Sanctuary Retreat - Pt. Kirehe, Paul Lee and Jani Dennis live at the head of the Whitianga Harbour, East Coromandel. As Soul Sax Plus they have produced 3 original albums. These 17 tracks represent a "best off" selection plus 3 new songs. 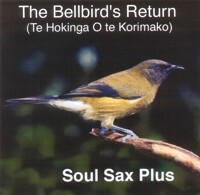 The title of the album celebrates the return of the native bellbird and Tui to Pt. Kirehe since the flowering of the replanted Pohutukawa and Puriri trees.